47.3 passes per game: Derby man attracts Premier League interest – is he good enough? Frank Lampard has taken to life in management like a duck to water this season, guiding Derby County to within touching distance of the Sky Bet Championship play-off places. The former Chelsea man has been a breath of fresh air at Derby, with his trust in young players becoming a very pleasing aspect amongst the Pride Park faithful. Plenty of youngsters have stepped up to the plate under Lampard, none other than Jayden Bogle, who has gone from strength to strength under the former England star. 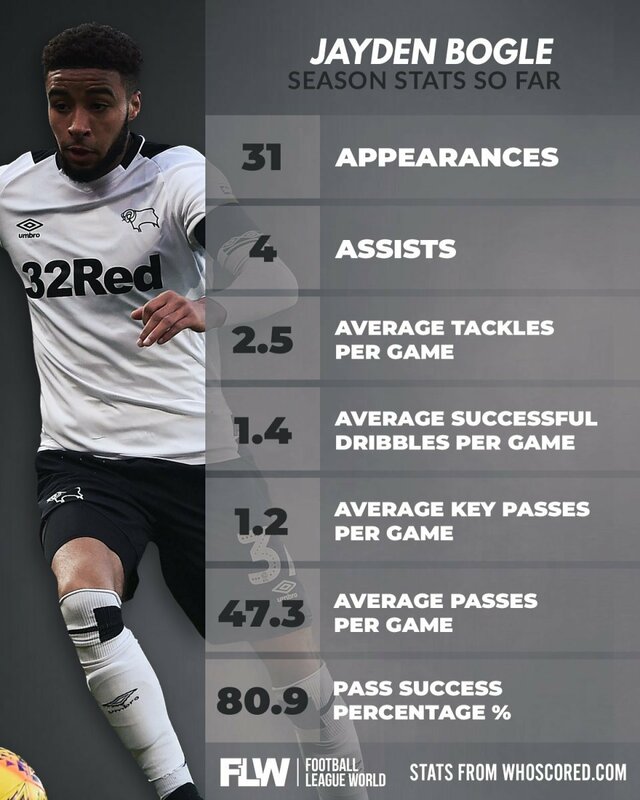 The right-back, who has been a regular under Lampard, has been one of Derby’s standout performers this term, and is attracting Premier League interest from the likes of Brighton and Burnley of late, following a string of impressive performances for the Rams. Bogle has been superb this season, enough so to nail a place down in the starting line-up ahead of a vastly experienced right-back in Andre Wisdom, who has fallen down the pecking order at Pride Park. The right-back likes to get forward as much as he likes to defend, completing an average of 2.5 tackles per game, whilst also playing a key role in driving the Rams forward and creating a hatful of chances in the final third – producing four assists in 31 appearances. Lampard’s style of play and formation gets the best out of Bogle, and allows him to push forward without worrying too much about tracking back all the time, thanks to an energetic three-man midfield. The 18-year old will want to improve on his dribbling in particular, though, having completed just 1.4 successful dribbles per game on average. But the right-back gets the best out of his teammates and has proved that he can cope with the high tempo of the Premier League, accruing a pass success rate of 80.9% from 47.3 passes per game, with only 1.2 passes of those being key.